Hey Guys! Hope you are doing well. The above calculator comes handy if you need conversion from Celsius to Rankine scale and is mainly called as Celsius to Rankine Converter. If you are aiming to convert any value from one temperature scale to another, you can’t brush off the sheer value of converters that give you the instant solution as per your research and experiments you are carrying out. Following formula is used for converting temperature from Celsius to Rankine scale. The temperature in the Rankine scale is equal to the temperature in Celsius degree plus 273.15 times 9/5. Convert 120 Celsius to Rankine temperature scale. 120 Celsius degree is equal to 707.67 in Rankine temperature scale. Following table shows some common values we mainly used for Celsius to Rankine Conversion. The Celsius is a widely used temperature scale that can be defined in terms of Kelvin. The -273.15 Celsius degree is equal to the 0 K, the point mainly known as Absolute Zero. Absolute Zero is the lowest temperature at which particles stop to flow in the channel. This temperature is mainly considered in solving the problems theoretically, as achieving this temperature under practical conditions is near to impossible. This temperature scale is widely used in expressing temperature intervals including differences between temperatures or their uncertainties. The Celsius scale is named after Swedish Astronomer Anders Celsius. Right after the inception of this scale, it was widely known as the Centigrade temperature scale until 1948. After that, the scale was named after the Astronomer (Celsius) who introduced it at first place. Centigrade is a Latin word that contains two parts where centum means 100 and gradus means steps. Before defining the Celsius scale in terms of Kelvin, it was defined as per the freezing and boiling point of water where it freezes at 0 ºC and boils at 100 ºC. Rankine is a temperature scale that can be defined as an absolute scale of thermodynamic temperature. This scale was introduced in 1859 by William John Macquorn Rankine. The scale was named after him. Rankine is denoted by ºR. The zero Rankine is also known as Absolute Zero which is also equal to zero in Kelvin scale. The point worth mentioning here is that both Celsius and Rankine scales don’t share a common starting point unless we add some offset to make them equal. 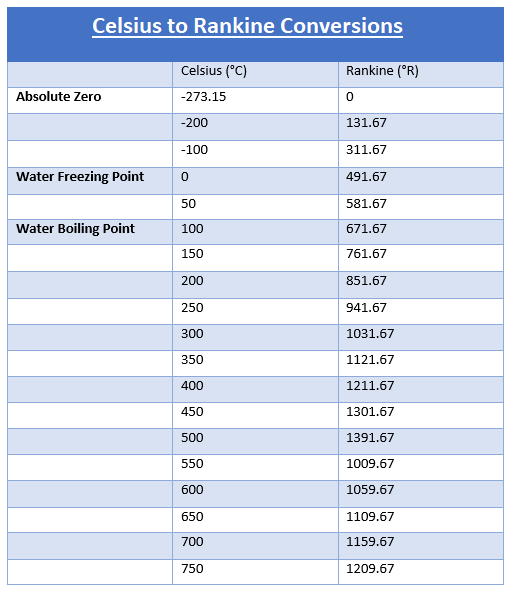 As per the table mentioned above, the water freezes at 491.67 ºR or 0 ºC or 491.67 ºR and boils at 100 ºC or 671.67 ºR. Apart from using Fahrenheit scale throughout the country, some engineering fields in the U.S. prefer the Rankine scale for measuring thermodynamic temperature. The Rankine temperature scale is widely used in engineering systems involving heating commutations. I hope this read brings some value and comes out beneficial in terms of giving you a brief overview of these two temperature scales. If you are feeling skeptical or have any question, you can approach me in the comment section below. I’d love to help you the best way I can. Thanks for reading the post.